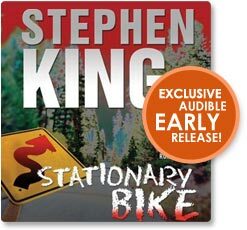 blog.iangoodsell.com: Is Stephen King even trying anymore? Is Stephen King even trying anymore? When I was younger, I was a really big Stephen King fan. I can remember staying up all night reading Firestarter, The Stand, IT, Insomnia, and Thinner (written as Richard Bachman). I couldn't get enough of Stephen King. To be honest, half of the time I stayed up all night reading was because what SK wrote would scare me half out of my skin. I still list The Stand as one of my favorite books. So I received the following email from Audible.com the other day. Yes, I know this looks like something The Onion cooked up, but it was a real piece of spam. and takes its owner on terrifying trips. Come on, now. How will I escape the scary stationary bike? Oh, I remember. By walking slowly to the other side of the room. Because it's STATIONARY. Stephen, I'm disappointed. I can't bring myself to even consider buying this. What's next, the iPod from hell (black, of course) that tells you how you're going to die? You could call it MP3. But seriously Stephen, if you're reading this and you like that idea please contact me! I'm a big fan.